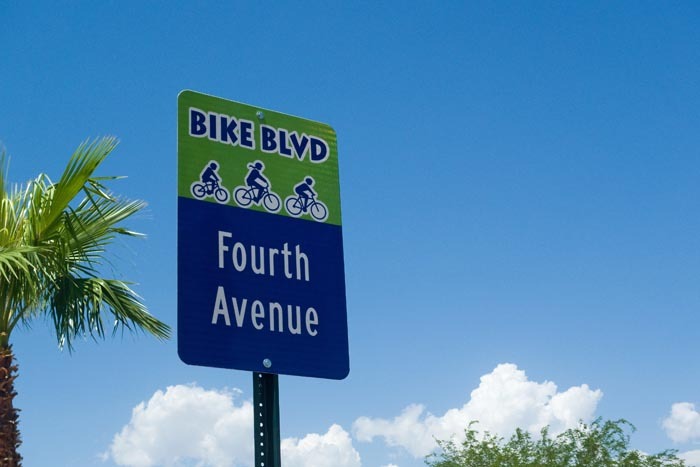 Tucson Police Department officers are ticketing motorists along the nearly complete Fourth Avenue/Fontana bike boulevard — a low traffic corridor that prioritizes bikes. See where TPD is setup, what rules the motorists are violating and how the bicycle boulevard looks today. Could bicycling contribute $500 million to local economy? One bike advocate is almost convinced it does and he is helping organize a economic impact study to find out for sure. See how much the study will cost and when it will be done. Over at Tucson Velo, we added two more bikes to our stable, but it got us thinking. When do you have too many bikes? What do you think? Construction on Tyndall Avenue, could help the route become an important connection to the University of Arizona, but it needs one thing. Money. Check out how it would improve getting to the UA. A local endurance drink company closes up shop. Read the story to find out why.